World no. 1 best seller. Safe & easy. Ammonia and bleach free.ColourB4 gives you the freedom to change your hair colour and be the colour you want to be. 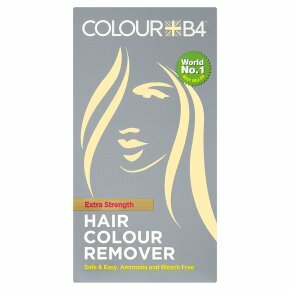 ColourB4 is the easy way to remove hair colour at home. Simply comb in, wait, rinse away and your hair is free of colour without using ammonia or bleach! The Benefits of ColourB4 Removes permanent, semi-permanent hair colour and colour build-up The Conditioning Buffer prevents re-oxidation allowing immediate re-colour whilst conditioning and strengthening your hair Please note: ColourB4 takes you back to your natural or lightest shade. It will return your hair to its natural colour if the artificial colour applied is darker than your natural level. If you have previously bleached or lightened your hair, ColourB4? us unable to return the (original) natural pigment. If you have applied a very dark or fashion colour (such as vibrant red or purple) to bleached, porous or grey hair, the cuticle may have been permanently stained. ColourB4? cannot remove cuticle staining. Remember<br>May colouring products, both permanent and semi-permanent may contain high levels of peroxide which can lighten the natural hair colour and in some cases cause a warm red-tone, or a lighter unexpected shade to be revealed once ColourB4™ has removed the dark artificial pigment. In addition some colouring products also contain high levels of silicone which can melt and become trapped inside the hair in circumstances where extreme heat has been applied, blocking subsequent hair product from effecting maximum change.<br>After using ColourB4™ you hair is now in perfect condition to re-colour.<br><br>Please note: some hair colourants (both permanent and semi-permanent) contain stronger levels of peroxide than others which can lighten your natural hair colour. ColourB4™ itself contains no peroxide, ammonia or bleaching agents and is not able to lighten the hair. Any lightening or alteration seen the hair's depth (after using ColourB4™) is due to previous colour applications.<br><br>Not suitable for children under 12.<br>Not suitable for henna treated or afro textured hair.<br>If pregnant, please consult you GP before use.